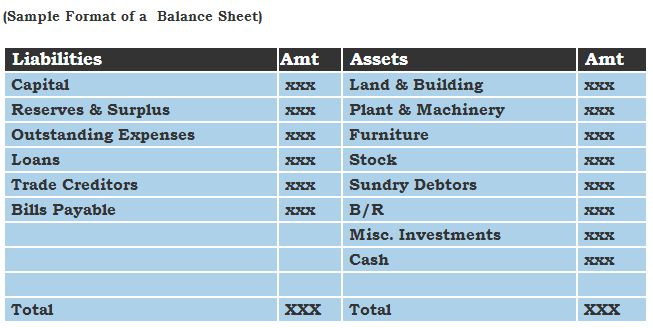 Home Books and Accounts What is a Balance Sheet? Balance sheet is a financial statement which shows the net worth of a company at the end of a financial period. A Balance sheet portrays the financial position of a company, disclosing what it owes and owns. It is an important document that needs to be prepared and submitted regularly like when submitting taxes, applying for grants or loans, while looking for investments etc. A company’s balance sheet comprises of three parts: assets, liabilities and capital or equity. Assets are tangible or intangible resources owned by the company that has an economic value which can be expressed and measured. From a business point of view assets include cash, inventory, investment, equipment, building, etc. Liability is a legal obligation to be paid by the company. Liability could be incurred due to business transactions happening in the company. In a business, liabilities could be – pending taxes, credit card bills, loans etc. Capital is the owner’s share on the company’s assets. This share is nothing but the assets that are left after the deduction of the liabilities. In a business, equity is what you infuse in the business. Owners Capital – An investment from the owner in the company and the net income earned that has been earned by the company subtracted by any withdrawals if made by the owner. An owner’s personal bank account and business bank account are two different entities. Retained Earnings – Part of the net income which is retained by the corporation instead of distributing it among its owners as dividends. A balance sheet is perfect only when the Total Assets are exactly equal to the Sum of Liabilities and the Owner’s Equity. If there is a difference in the amounts, it needs to be rechecked for missing items.